With poor learning outcomes of students in government schools, as reflected in the recent Gunotsav results and the findings of the National Achievement Survey (NAS), the Education Department of Gujarat government has decided to launch a two-month-long campaign, beginning July 15, with an aim to improve the students’ ability to read, write and perform simple calculations. At the end of the campaign, the government said, teachers who will fail to perform will be “penalised”. The decision was taken on Wednesday at a meeting of all district education officers (DEOs) and district primary education officers (DPEOs), chaired by Education Minister Bhupendrasinh Chudasama in Gandhinagar. With the focus of the campaign being “weak” students, all DEOs and DPEOs have been directed to identify and prepare a list of all such students from across the state. These students will be taught after school hours. Besides telling the teachers to put in additional hours after the school, the government plans to rope in retired faculty members as well as officials of other departments like cluster resource centre (CRC) co-ordinators and block resource centre (BRC) co-ordinators, district institute of education and training (DIET) lecturers among others. Services of teachers who can speak and understand local language will also be utilised by the schools. “Senior officials of the Education Department will make surprise visits to ensure that these activities are being followed, along with regular monitoring of the students. Also, at the end of the two-month period, these students will be evaluated. Teachers of non-performers will be punished in a way of holding back their increments,” said a DEO who was present at the meeting. Chudasama has also asked the DEOs and DPEOs to help improve the state’s results in next National Achievement Survey, which will be carried out in 2019. The Indian Express had published a detailed report in May this year, highlighting the dismal state of school education in Gujarat by collating the findings of the latest National Achievement Survey. As per the recent findings of the NAS, conducted by the National Council of Educational Research and Training (NCERT), Gujarat was ranked at ninth position among all the states. The NAS findings revealed that from class III to VIII, the response level of students fell from 65 to 47 per cent in mathematics, 71 per cent to 64 per cent in language and 68 to 52 per cent in science subjects. 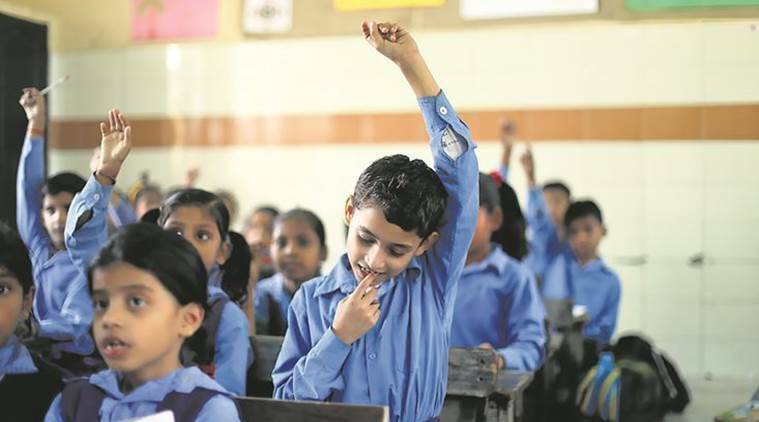 In class III, 41 per cent of students could not read and write numbers up to 999 and more than half of the 41,393 class VIII students (53 per cent) could not solve problems on daily life situations involving addition and subtraction of fractions and decimals. For Class VIII, four districts scored a mean average of below 50 in the NAS. While Bharuch scored 44, two districts from Saurashtra – Amreli and Jamnagar – scored 29 and 48, respectively. The tribal districts of Sabarkantha and Narmada scored 48 and 46, respectively. “In the NAS results of 2017, there has been an improvement of 9 per cent in language, Mathematics and Science, but further improvement is still required,” the Education Minister told The Indian Express.